TURALEI, Southern Sudan — ‘Bring food. There is none here.’ It was prudent advice, arriving by text message in a rare patch of cell phone network coverage, as the red mud-splattered vehicle barreled north toward the area where most of the estimated 96,000 people displaced by recent fighting in the disputed area of Abyei have temporary settled. The influx of displaced people fleeing the recent outbreak of violence in Abyei and destruction of nearby villages has placed a strain on basic goods in the small towns forming a semi-circle south of the conflict area. Many of the displaced are staying in host families and sharing their food. The rare restaurant, which serves a simple menu of meat stew, beans, and bread, regularly runs out of food. Lines at the water pumps are especially long, and bottled water is difficult to find, as are scratch cards for mobile phone airtime. As the homes of locals in the small town of Turalei reach capacity, many people sleep and arrange their few belongings on straw or plastic mats rolled out in the shade of trees or shadow of mud and thatched huts. If rain clouds roll in, people pack in under corrugated metal awnings of storefronts or huddle under the dilapidated cover of the structures that line the town’s main street, made of scrap metal, bits of wood, and tarp. As night falls, the embers of small coal-powered stoves glow along the street that is otherwise lit by an occasional light bulb powered by humming generators. Making matters much worse, the roads from the north are closed, cutting off this area from its usual supply of essential goods – most problematically, petrol. In fact, the fuel shortage has been mounting for several weeks, now becoming dire. Prices began to rise in early May. Today, in the town of Wau, where many of the supplies for the Turalei area are coming from, a liter of gas costs $4.50 and is often hard to find, compared to $1.80 before the shortage. In the first days after fighting broke out in Abyei and aid organizations rushed to respond, it was possible to find some fuel, necessary for powering not only cars and motorbikes but also for lighting and small generators in South Sudan. As supplies decreased, petrol was still available on the black market – but only at wildly speculative prices that reportedly even reached $12 a liter. Then, in Wau for instance, the black market ran out. Even longer lines formed at the one pump in town, manned by soldiers, and the governor began issuing letters to organizations responding to the humanitarian crisis that would give them priority to fill up their vehicles. For an illustration of the effect the fuel shortage is having, take the example of one international aid organization, which will remain nameless because its staff is not authorized to speak publicly about the situation. The organization doesn’t typically work in Turalei but has joined the many humanitarian groups that have mobilized to respond to the mass displacement from Abyei and is charged with being one of the first to respond when new gatherings of displaced people are identified. The group has five vehicles here, but until they received a drum of fuel from Wau, all but one had run out. “It is wrong according to our procedures to stay in a place until we run out of fuel. But here we had no choice,” said one staff member. A few days later, as they reach the bottom of that drum, they are facing the same predicament and have to adjust their response as a result. “The North was blockading the South in preparation for [the recent offensive in] Abyei,” said the staff member, articulating a sentiment that is difficult to prove but is nonetheless widely believed. Even as they distribute bags of sorgum and cans of cooking oil to the displaced, aid workers themselves find little to eat. “The past few nights, by the time we’ve gotten back to town, the couple of restaurants we usually try have run out of food. I’ve been running on a few slices of bread pretty much since I got here,” said an aid worker living in Wunrok, the town neighboring Turalei. In addition to the huge shipments of food and supplies to distribute, groups are also transporting in bottled water for their staff. At the time of a humanitarian crisis, attention on the challenges facing aid workers may seem misplaced, but it illustrates the desperation of a situation to understand that even those sent to provide services are running low on the basics. The current hindrances don’t appear to be easing soon. While some of the displaced people are moving home to Agok, tens of thousands from the area now occupied by the northern army will remain vulnerable and dependent on aid for potentially many months to come. Strains on the host communities will likely become more acute so long as the de facto economic blockade continues. 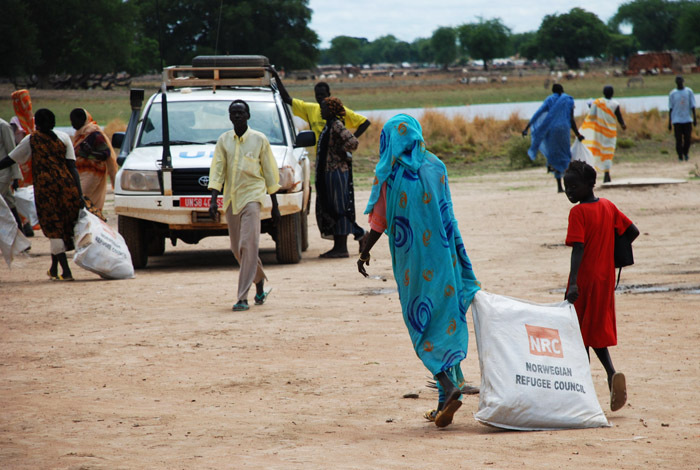 The rainy season is just beginning, and the U.N. humanitarian coordination agency reported that aid groups are positioning additional supplies in anticipation that some of the communities they’re currently serving may soon become isolated as the rains wash out roads. Those running logistics for the humanitarian response are also keeping a watchful eye just to the east, where the southern militia leader Peter Gatdet is operating. The main road from Turalei to Agok, which so many aid convoys need to use, passes perilously close to Mayom County, where Gatdet’s forces have been causing havoc.